Meet the world's smartest puppy!!! Really. 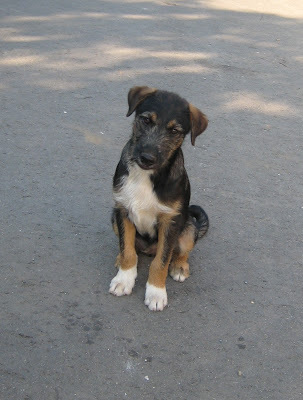 He is a stray-born male pup of about 5 months of age. He is beyond smart- he can get himself out of enclosures, literally climbing them as you see brilliant canine escape artists. Furthermore, he even climbs ladders and gets high up! He also tickles a lot, he's really funny when you pet his belly. Finch loves the musketeers and comes to eat and play with them. He also has a funny, curly tail as you can see.